Is this the end for Fixed-Odds Betting Terminals? Before we dive into this potentially industry changing shift for bookmakers, I need to start with a quick statement for all those new to this blog or matched betting as a whole. Matched betting is not, nor will it ever be gambling. Matched bettors do not like gambling or the gambling industry when they engage in the practices such as those discussed in this blog. To be clear, I don’t hate bookmakers – as a matched bettor I need bookmakers to exist in order to exist. However, when it comes to fixed-odds betting terminals in bookmaker shops, I will pull no punches. I absolutely, unequivocally hate fixed-odds betting terminals and everything they stand for. Right, with that out of the way, let’s provide some much-needed context for those who have no idea what I am talking about. 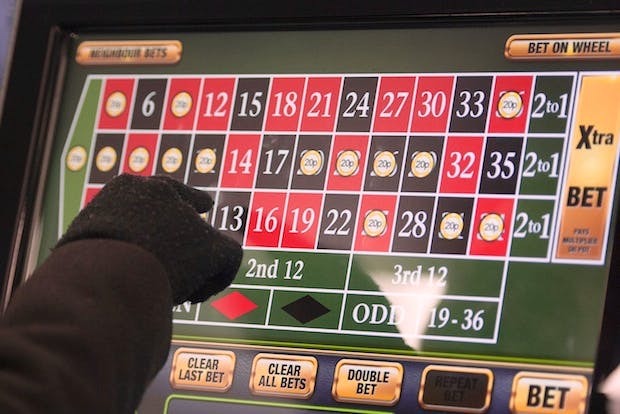 ‘Fixed-odds betting terminals’, or FOBT’s for short, are a type of electronic gaming machine, found in high-street bookmakers, that offer games with fixed odds – such as roulette, blackjack and bingo. They can be, quite literally, lethal (that is no exaggeration) to anyone with an even slightly addictive personality. Their entire design is based on giving the customer the idea that they have an advantage. This is an illusion. If you can place money on something where the odds are determined by no other factors except the bookmakers discretion, you will lose….a lot. On top of this, the maximum stake per turn is currently as high as £100. When these two factors are combined, punters don’t just lose thousands, they lose tens of thousands in pursuit of this impossible ‘edge’ they believe themselves to have over the bookie. This may seem ridiculous, but when it has been proven that using these machines lights up the same parts of the brain that react to crack cocaine, you can begin to understand how people find themselves in such a perilous predicament. So, it was with genuine joy that I read the recent surge of news articles talking about the government reducing the maximum stake of these machines down from £100 to just £2. Whether the government has the teeth and will to follow this through is a possibility that somewhat dampens my mood. To help explain my scepticism, we need to remember one thing – the gambling industry is massive. I mean, it really does make a colossal amount of money. And one of its biggest earners are FOBT’s. Last year, FOBT’s generated £1.8bn in revenue for the betting industry and resulted in taxes of £400m going to the government. Keep in mind, that is JUST FOBT’s. Now, the bookmakers are not going to let this revenue slip through their hands without a serious fight. The problem comes from the Government going into the fight with one hand tied behind their back, because (spoiler alert) they need to find £400m from somewhere else if they are not getting it from the bookies. It is thus, not surprising then that we’ve seen massive delays in the rolling out of this new proposal already. Originally, the new law was due to come into force in April of 2019, but has since been delayed to October 2019. The bookmakers have a lot of influence in parliament and I would not be surprised to see this delayed into 2020. No government wants to be the one to deal with a £400m hole in their budget. It will take someone with true determination to cut through the money and vested interests that will potentially bog down this law. But regardless of my pessimism, this is indeed still some cause for celebration. Not just as a matched bettor, but as a human being. Gambling addiction is a terrible thing and this change to the maximum stake will undoubtedly help – but of course, it will not be the complete solution. For matched bettors this has the potential to be either very good or potentially very bad. Firstly, lets look at the good. £1.8bn is a lot of money, and that money has to be made up somewhere. It is my thinking that bookmakers will make a heavy swing towards online markets, most notably mobile. Betting apps will be pushed and marketed until the cows come home, as bookies began battling to gain and maintain a greater online audience. Now, what do you need to maintain the notorious fickle online audience of today? Incentives. Which, in the world of gambling, come in the form of free bets and odds boosts. This, would mean a boon for matched bettors and will likely result in a slight relaxation of the bookmaker’s favourite pastime of restricting customers who use their promotions. It ‘could’ be a golden age for matched betting. However, what has me slightly worried is not so much the bookmakers but the government. For you see, they will have a large financial hole to fill. What should they tax to make up the difference? Well, the logical approach is to find something to tax the bookmakers on. After all nothing will get them more positive PR than going after the gambling industry even more. What they decide to tax is a bit of a moot point, because any additional tax on the bookmakers will trickle down to the customers and could well manifest itself in reduced generosity when it comes to welcome/reload offers. So, is this the end of FOBT’s? In their current form, yes. Whilst the legislation may be delayed, it will almost certainly go through. However, it is the fallout from this that will be of the most interest. Specifically, how will the bookmakers and government interact in the post-FOBT world.